Two USB 2.0 interfaces to connect a PC to the FPGA and the ARM processor respectively. The PC-FPGA connection supports signaling rates of 480 Mbit/s (High Speed), 85 Mbit/s sustained throughput. Real-world applications require more than digital signal processing. 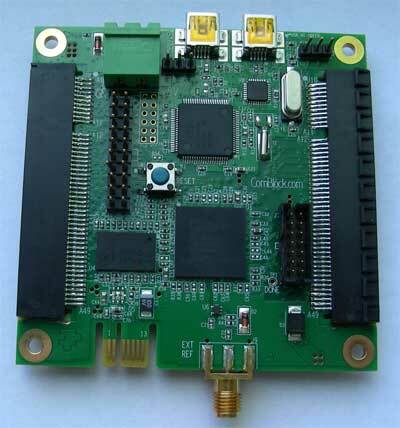 The COM-1600 connects to numerous ComBlock modules, like the COM-2802 Synchronized 8-channel DACs at 900 MSamples/s or the COM-30xx RF receivers for frequencies ranging from 0 to 2.8 GHz, and many more.